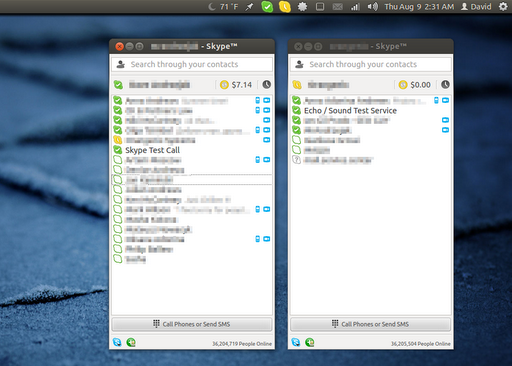 In Ubuntu with Unity it is still possible to run multiple Skypes. You'll need to install Skype 4.x if you havent done so yet. Just head over to skype.com and download the linux version and install. The newest version is already in the Ubuntu Software Center as well. So now you have two installed instances of Skype. That was pretty dang easy, right? We now need to link up to those, so lets create a launcher for the two different Skypes. So your launchers are both made and can be found in your new /home/myapps directory. Open up your file browser and go there and you should see the two new instances of Skype. Click the first one and after it opens, pin it or lock it to your Ubuntu Unity launcher. Do the same with the second and lock it to the launcher. THATS IT. Whew! Now you can run multiple instances of Skype in the newest versions of Ubuntu! 2 comments to ''Run Multiple Skype Instances in Ubuntu/Linux Mint/Other Linux"
Wherever you want to launch your second skype.